Michael Bay’s Transformers cinematic movies have been down a rocky road. Debuting back in 2007, the first film (Transformers) was met with some scrutiny from critics and from fans of the Hasbro toys franchise, but raked in big money (Over 700 million) at the world box office. The film ultimately proved strong enough to warrant a movie franchise and expanded into sequels with 2009’s Transformers: Revenge of the Fallen and 2011’s Transformers: Dark of the Moon. Though both sequels commercial grossed more than the first installment, both films were met with heavy criticism and reviews ranging from mixed to negative, questioning the franchise’s longevity for future movies. Several years have passed and now, in an attempt to rejuvenate the series, Michael Bay’s giant alien robots return to the big screen in Transformers: Age of Extinction. With a primarily set of new cast and characters, does this quasi-reboot look to rise above its predecessors or does the film fall, spelling the utter doom for this movie saga? After the battle in Chicago, which took place at the end of Dark of the Moon, the U.S. government has decreed that all Transformers, both Autobots and Decepticons, are to be hunted down and exterminated by a black ops group that’s being spearheaded from C.I.A official Harold Attinger (Kelsey Grammer). In Texas, Cade Yeager (Mark Wahlberg), a down-on-his-luck robotic tinker, is trying to keep his house and workshop out of foreclosure, while trying to be the “Overbearing” father figure to his teenage daughter Tessa (Nicole Peltz). Cade soon accidentally comes across a damaged truck and begins to repair it, shocked to find out it’s the Autobots leader Optimus Prime (Peter Cullen), who’s now a fugitive on the run. Evading Attinger’s task force operatives, Cade, Tessa, and her race car driver boyfriend, Shane Dyson (Jack Reynor), team up with Optimus and a handful of remaining Autobots to thwart plans of a technology tycoon Joshua Joyce (Stanley Tucci), who has found a way to manipulate “Transformium”, a special lifeblood material of a Transformer. To make matters worse, a bounty hunter Transformer named Lockdown (Mark Ryan), who shares no allegiance to either Autobot or Decepticon, has been sent by The Creators, the beings who created the Transformers, to capture Optimus, aligning his forces with Attinger to complete his mission. To be honest, Transformers: Dark of the Moon was my least favorite of the Transformer movies, only seeing it once when it came out on Blu-Ray. By the time the film ended, I believed (As did many others) that the Hasbro movie franchise of Transformers had reached, once and for all, the end of its lifecycle. 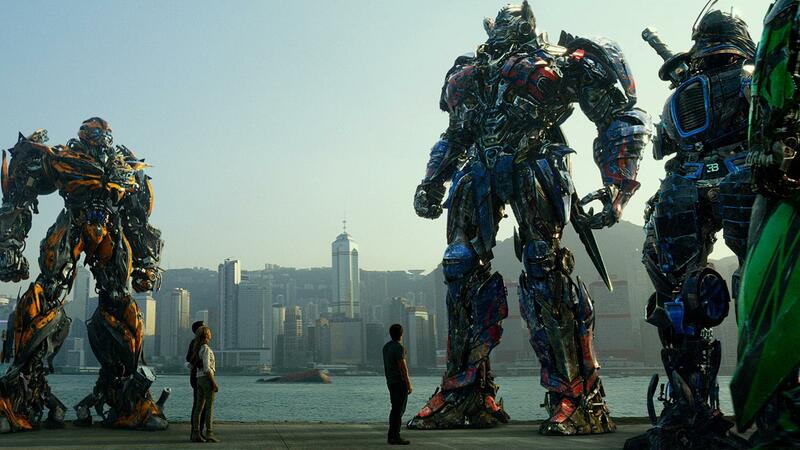 That’s why I was somewhat shocked when they announced a fourth Transformers installment to coming out in 2014. Like many, I was genuinely skeptical about seeing this movie, given the decline of the last two sequels in the series, and walked into the movie with sour taste already in my mouth. After viewing Age of Extinction, I walked away with a little less (But still sour) taste in my mouth and a mixture of good and bad feelings towards this movie. Age of Extinction’s first act (the first 45 minutes) was probably the strongest part of the entire movie. The opening scene and a little bit of the plot seems to be fundamentally derived from the Riddle Scott’s film Prometheus, which is quite interesting to see play out here in a Transformer movie, but it’s not the entire premise of the film (Presumably to be explained further in the future Transformer films). Combating franchise fatigue, the film moves away from Sam Witwicky story that was main focus of the first three movies and focuses on introducing a new main character thread to follow. The introduction of Cade and his life is intriguing and great way to re-introduce the world through his eyes as he mechanic on a downward spiral, while raising a feisty teenage girl who wants to break away from his overprotective single father. Unfortunately, as great as the first act is, when Age of Extinction’s second act begins, the explosive action mayhem is unleashed as director Michael Bay, who has helmed all the Transformer movies, returns in all of his destructive glory. Know for disaster galore and an array of big-time explosions, Bay, holds nothing back as he relentlessly pushes his signature action down your throat with little downtime to breath. This, of course, is good for awhile, being a summertime action popcorn flick is always a joyride, but slowly wears thin on a viewer’s attention as what I call the MBF (Michael Bay Fatigue) sets in. Perhaps this is because of the film’s running time of 165 minutes, the longest film of the Transformer franchise to date. It’s a herculean test of endurance of MBF that viewers must endure as the film could’ve been easily trimmed down a good 20 to 25 minutes and with the core storyline intact. The repetitive nature of action upon explosion upon destruction upon more action is a very trying task and deludes the overall freshness of the film’s first act. Even I, a movie junkie who is use to these types of movies, felt extremely exhausted by the time credits began to roll, left mentally drained with my mind completely numb. The visual effects for the movie are incredible. The creative visual wizard engines at ILM (Industrial, Light, & Magic) have truly outdone themselves. All Transformers look impressive, both good and bad ones, and the level of detail put into them is amazing. This is very helpful when the attack gears up and the kinetic frenzy of Transformers fighting as you can clearly now see who’s who brawling (A problem that persisted in the last two sequels). It is also to be noted that the film’s score is pretty good. Steve Jablonsky, who composed the score for all three previous Transformers movies, returns once again and brings the right touch of orchestral themes, moments of tension, and musical sympathy to this summer blockbuster. With Age of Extinction being somewhat of a reboot for the franchise, the primary human cast members from the first three films did not return with the movie replacing the old with fresh new faces. Wahlberg does an excellent job as the new male lead, much better than LaBeouf’s Sam. He brings the right amount of endearing goofiness to the character of Cade, while also flexing his action appeal when crosshairs of danger. Relatively newcomers, Nicole Peltz’s Tessa and Jack Reynor’s Shane look really good together as girlfriend / boyfriend, but lack depth as the filmmakers should have given the pair more screen time to make their characters more profound and memorable. In the villain category, Kelsey Grammer is great as Attinger as well as his lead henchmen James Savoy played by Titus Welliver. Both play villainy with ease, even if it follows the path of being a stereotypical bad guy. Lastly, Stanley Tucci does a good job as the egoistical tycoon Joshua who plays both as bad guy and is delegated for delivering several comic relief moments. The Transformers themselves have been given a wide range of personalities to convey on-screen; some are good, while others are goofy for comic relief. Peter Cullen continues to be a great voice to Optimus Prime as well as Bumblebee who continues to use audio sound bites to speak and the miniature robot Brains voiced by Reno Wilson. Join them are a fresh batch of Autobots Transformers is present in the film including voice talents of John Goodman as Hound, Ken Wantabe as Drift, and John DiMaggio as Crosshairs. Debuting in Age of Extinction is new Transformer bad guy named Lockdown. He looks cool, voiced perfectly by Mark Ryan, who has starred and lent his voice on previous Transformers movies and video games, and is a complete badass on-screen. Also debuting in the movie is, of course, the Dinobots. Unfortunately, while they figure in vaguely into the film’s plot and look amazing on-screen, their exciting impact on viewers is lessened due to their late arrival in the movie as the syndrome of MBF has long been set in. Also, with a heavy emphasis on their appearance in the film’s trailers and promos, their presence is more of a visual standpoint rather than storytelling one, which is disappointing. With Lockdown’s Introduction, a bitter Optimus, and hostile Transformer / Human relations, Age of Extinction is slightly darker tone than other Transformer movies. Yes, it does have that silly comedy that pervades the entire series, but less of it and more toned down, so no unnecessary awkward scenes like Bumblebee peeing on John Turturro’s character from the first film or the two annoying / racial stereotyping Autobots from Revenge of the Fallen. Could there been more time for some characterization, yes. Could the story be more refined, yes. Could the film be trimmed down, yes. All of these things could’ve made the film that much better, but this is the fourth installment of the franchise and with Michael Bay still directing these movies, things aren’t going to make a complete 180. In short, there are some new surprises here and there (Whether in action scenes, visual effects, set pieces, or new characters), but don’t expect it to be something outside of the realm of the previous Transformer films. Transformers: Age of Extinction is an exhausting and perplexing movie that will be divided by many viewers and critics alike. Fans of the previously movies will enjoy this fourth chapter of giant alien robots on Earth, while others will probably stay clear from viewing this feature. Personally, the film has its merits and its faults. It has an interesting first act, improved visuals, a new male lead hero, a new cast and ending that leaves the franchise in interesting place for uncharted territories, but excess quickly steps in with elongated action sequences, battle fatigue, and convoluted plot points. In all, the Transformers cinematic franchise took two steps backwards, but took several steps forward in the right direction. I thought it was okay, proving to be better than Revenge of the Fallen and Dark of the Moon, but not as good as the first film. There’s still hope for movie saga to continue, perhaps with the departure of Michael Bay and his blockbuster moviemaking formula that the franchise can be more than meets the eye. Your right. I thought the first 45 minutes were good, but it just when south really fast.